Retiring - Many retirees have often had to down-size their living arrangements, resulting in loss of the man's personal space, usually the garden shed or workshop. Sharing - So the idea of community based sheds was born. Here members can come and share a fantastic variety of tools and equipment, still pursue their interests in pastimes and hobbies, spend time with others of similar interests, learn new skills or use tools for the first time - or keep old skills honed. Contributing - Here you can feel viable and vigorous by contributing to community needs or create projects of personal interest and expertise. Shed Hours - 10am to 3pm Monday, Tuesday, Wednesday and Thursday. Closed on Public Holidays. Everyone is welcome - The Ku-ring-gai “Shed”, has been set up as a shared facility to replace or complement the home workshop. Anyone who feels the shed could cater for their needs, and would like to enjoy what it offers, is welcome to visit and then consider joining. Facilities - The Shed has well-equipped workshops enabling shedders to undertake a wide range of woodwork, wood and metal turning, light engineering, welding, picture framing and other practical tasks. Skilled and unskilled shedders can share time with each other, learn and swap yarns and work together on community projects. 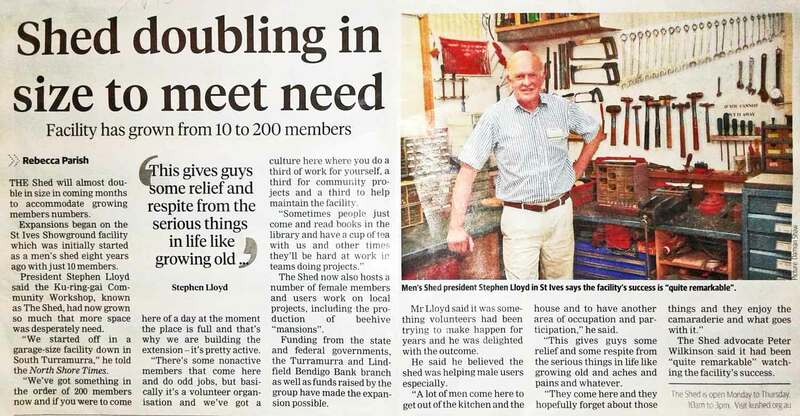 Social - Besides encouraging new social activities and friendships, The Shed provides access to other networks for men including local activities and men’s health information. Reading - The Information for Members letter provides further information for new and existing members, please read it to familiarise yourselves with the "day-to-day" matters. Media - See the interview in the North Shore Times of Stephen Lloyd by Rebecca Parish.